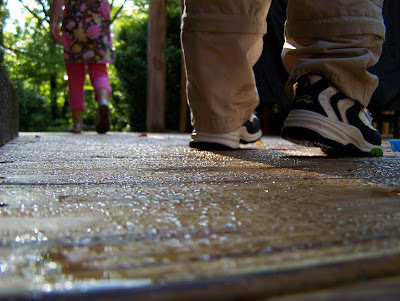 Here is a shot I took last week of my kids finally getting to play outside after being inside all day. The sun was just starting to peak out and so the lighting was perfect. 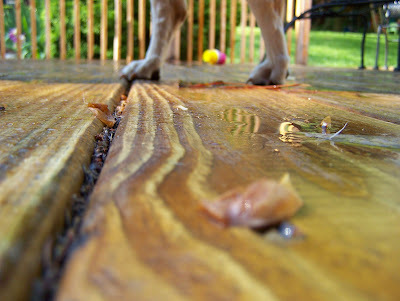 I also loved how the rain droplets were still on the newly sealed deck. The sun is really shining. It is rainy here today and I would love to see a little bit of this sunshine. I hope everyone has a wonderful Thursday. Head over to The Land of K.A. for some more great photos. love the feet on the deck! there's something magical about the sun coming out right after the rain! 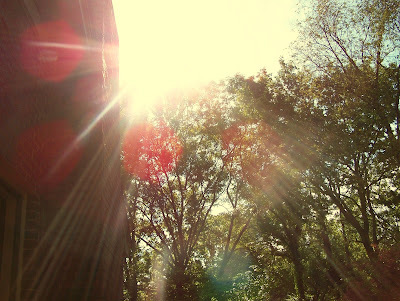 Love these shots - the sun flare is great! Hope it clears up for you soon. Great photos! We had rain all weekend, too. It was wonderful to feel the sun on our faces! I really like the feet on the deck shot! Great capture! Those are gorgeous! I love the angle on the first one - it's so original and fun! I love that last shot, very cool! And the feet on the deck are so cute. LOVE LOVE the prospective on the first picture!